Following the toppling of the Ghaddafi regime in 2011 and renewed internal conflict in 2014, Libya fell into an acute economic crisis. 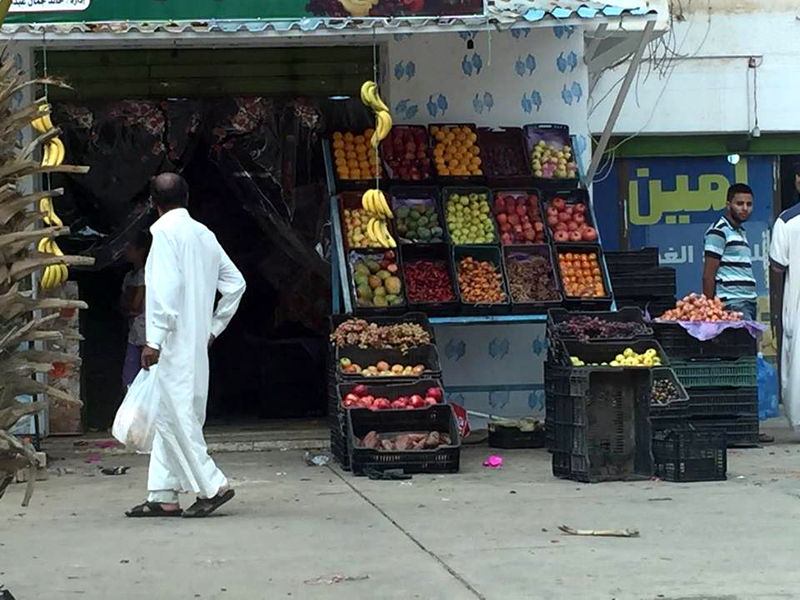 The economic meltdown spiralled into an ever-worsening currency and liquidity crisis, and as of today, the Libyan dinar has lost most of its value, creating a significant gap between exchange rates in the official and parallel markets. These developments have had significant impacts on the everyday life of the residents of Libya, and most can only access the parallel market where the exchange rate of dinars to US dollars is five times higher than the official rate. The prices for basic commodities have skyrocketed making basic goods no longer affordable nor accessible to large parts of the population – including refugees and migrants. Although an estimated 700,000 refugees and migrants are present in Libya, little information is available on how they have been affected by the economic and liquidity crisis. 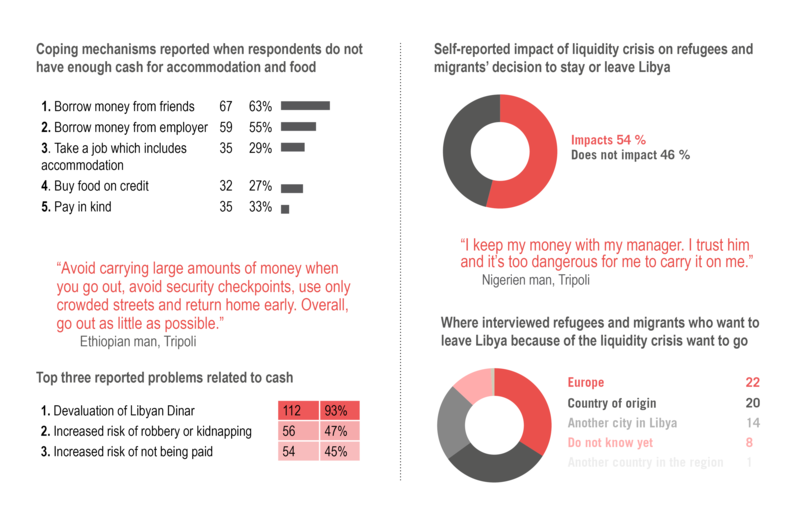 In order to fill this information gap, REACH conducted a study analysing how refugees and migrants access and interact with assets and cash in Libya. The study is based on 120 in depth-semi structured individual interviews with refugees and migrants and 20 key informant interviews with shop keepers, migrants’ employers and informal money exchangers. The study was conducted in partnership with UNHCR and aims to inform actors working in humanitarian and policy responses to mixed migration in the country. While the liquidity crisis impacts all population groups, the assessment found that the situation is affecting refugees and migrants in specific ways. First and foremost, the limited availability of currency, coupled with the widespread knowledge that refugees and migrants are paid almost exclusively in cash, has increased their exposure to robberies and kidnappings. Also, the shortage of cash has made it more likely for refugees and migrants not to be paid for their work. Additionally, the poor exchange rates available in Libya has led refugees and migrants to work more, yet earn less than before. Consequently, migrants and refugees have to spend more time in Libya in order to collect adequate funds to make ends meet, save for an onward or return journey and to send money to their families. The liquidity crisis has thus led to the disruption of important remittance systems across the region. Yet, the assessment found that almost half of the respondents reported that the monetary crisis did not impact their decision to stay or leave Libya. Among those who said that the situation did impact their decision to stay or leave the country, the majority reported that they did not want to go to Europe as a result. Rather, respondents considered returning to their countries of origin or expressed wanting to stay in Libya for the time being. Findings from the Access to Cash and the Impact of the Liquidity Crisis on Refugees and Migrants in Libya report highlight the impact of liquidity crisis on migrants and refugees living and working in Libya. The extent to which all population groups, Libyans and non-Libyans alike, are impacted by the liquidity crisis calls for long term measures to restore trust in the banking system and attract foreign investments to stabilize the country. As the most recent events in Tripoli have shown, the economic and security situation in Libya remains highly unstable. In order to contribute to a better understanding of the situation of refugees and migrants in the country, REACH will continue to monitor mixed migration with regular outputs on the topic on a bi-monthly basis. For a more comprehensive overview of the findings from the report, visit Libya’s page on the REACH Resource Centre and read Access to Cash and the Impact of the Liquidity Crisis on Refugees and Migrants in Libya.